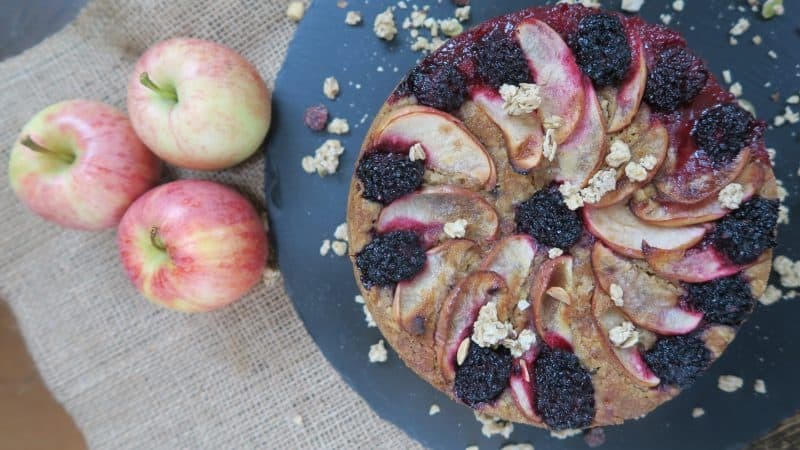 With the autumn swiftly approaching, many people are searching for ways to use freshly-picked blackberries or fallen apples – and this gluten free granola cake recipe is perfect. Filled with warm flavours, the delicate fruit is complemented by the rich crunch of cinnamon granola. I love Nature’s Path – their ethos in using only organic in their gluten free cereals fits perfect with the way of eating I like to follow. 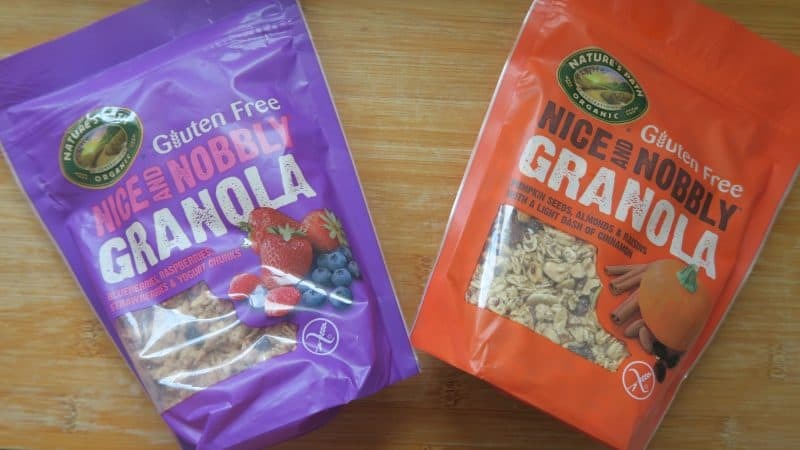 I always turn to their free from cereals, and their Nice and Nobbly Granola is my favourite. 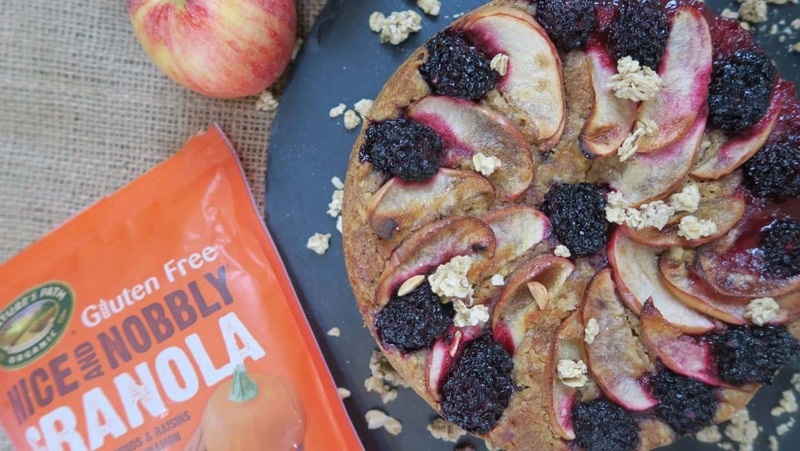 That’s why I’ve teamed up with them to use their granola to create this gorgeously gluten free granola cake recipe. Oh, and it’s also egg free too, so perfect for those with multiple allergens. Before we move onto the gluten free granola cake recipe, let me first tell you a little about Nature’s Path and their cereal range. 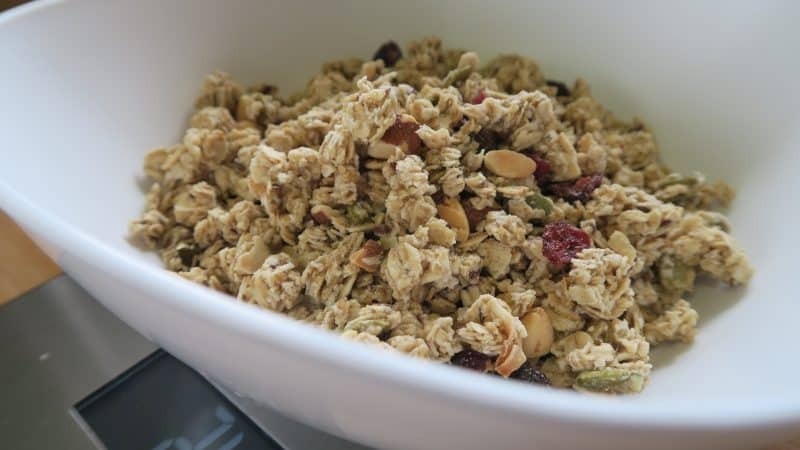 They have a fantastic and diverse gluten free range, with everything from their wonderfully moreish granola to their Maple Sunrise and Mesa Sunrise, which are the perfect start to the morning. The Nice and Nobbly yoghurt and berry granola is perfect topped with almond milk and some fresh strawberries, while their cinnamon and pumpkin seed granola is full of the flavours of autumn (and also vegan too!). My favourite thing about Nature’s Path is the fact that founder Arran Stephens created the company, inspired by his father’s mantra that a farm should “Always leave the earth better that we found it”. They use ethical and sustainable cereals as well as responsible farming to ensure not only do the products taste great, but they’re easier on the planet too. I was inspired to create this gluten free granola cake recipe when I woke up on a rainy Sunday morning, the wind whipping around the trees. It felt like autumn had finally arrived. I chose to source organic ingredients where possible, to tie in with the ethos of Nature’s Path, and make this recipe gluten and egg free, as well as vegetarian. If you wanted to make it dairy free (and vegan) you could use a dairy-free spread instead of butter. 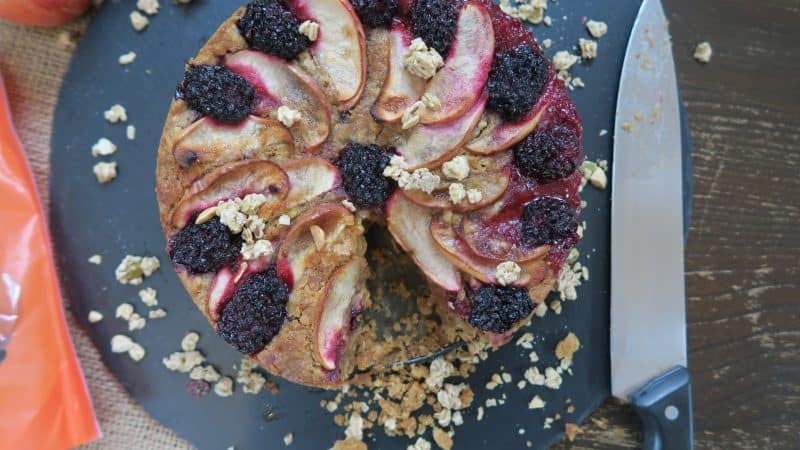 The sweet gala apples in this gluten free granola cake compliment the tangy, ripe blackberries, which are perfectly in season. I think apple and cinnamon is the ultimate combination, which is why the Nice and Nobbly Granola works so well. It’s quite a soft cake, but is delightful eaten either warm with custard or ice-cream, or cold with a cup of tea. However you eat your cake, I’d love you to share it in the comments below! A delicious autumnal treat, this gluten and egg free granola cake recipe can also be made dairy free and vegan too. Preheat the oven to 180’C (Gas 4 / 356’F). Grease and line a 20cm loose-based cake tin. Chop the apples into quarters, core them and then finely slice. 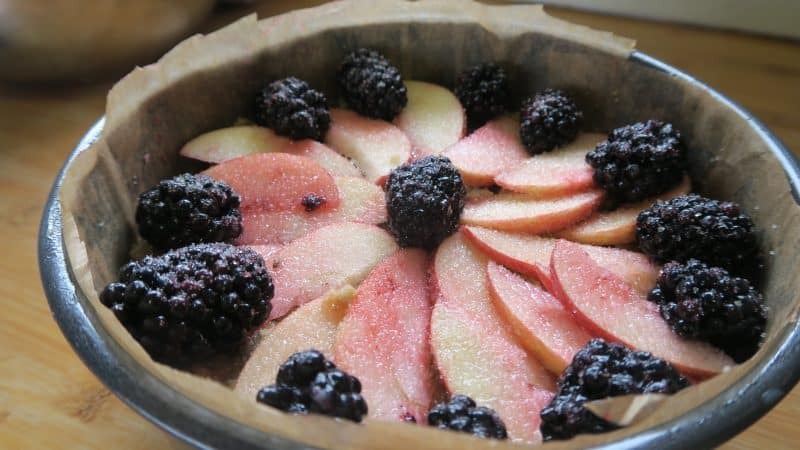 Rinse the blackberries well and then add the apples and blackberries to a bowl with the lemon juice. Stir gently so the apples pick up some of the lovely, pink colour. In a large mixing bowl add the granola, muscovado sugar, allspice and salt. Mix until combined evenly. Gently melt the butter on a low heat in a saucepan. As soon as it has melted, remove from the heat and add to the flour/granola/sugar mixture. Place half of the mixture into the cake tin and press down. Add around two-thirds of the fruit mixture on top and arrange evenly. Then place the rest of the cake mix on top, and press down gently until the fruit is covered evenly. 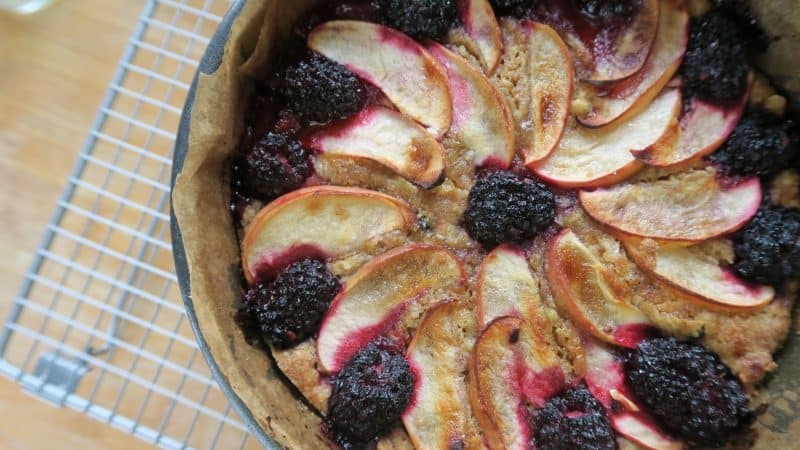 Arrange the rest of the fruit on top (either at random, or create your own pattern) and sprinkle with the light brown sugar. Bake for 40-45 minutes until the top is golden. Some of the fruit mix may bubble up, so I find it helps to place a tray under the cake on the shelf below to catch the drips! Remove from the oven, and leave to cool for around half-an-hour until you gently remove it from the tin and lining paper. Enjoy warm with ice-cream or custard, or have some cold as the perfect afternoon snack. Nature’s Path cereals are available in Tesco, Waitrose, Morrisons, Asda, Wholefoods plus other health food stores. Also online on Ocado and Amazon, RRP £3.00. This post has been sponsored by Nature’s Path. I sometimes accept sponsored posts with brands I love and trust, but my opinions are always my own. Previous Post WIN! A giant gluten free hamper!